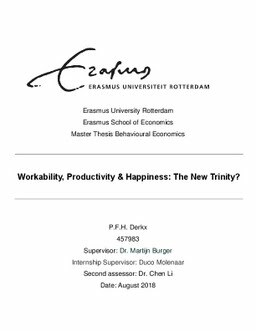 Erasmus University Thesis Repository: Workability, Productivity & Happiness: The New Trinity? Workability, Productivity & Happiness: The New Trinity? The primary focus of this study has been to identify causal relations between the concepts happiness, productivity and workability. The motivation was the lack of research on the causality and direction of influences within this triangle. Another aim is to show that a worker’s happiness isn’t a separate goal, next to profit maximization, but merely an integral part of it. Operating with these three aspects in mind will create value for companies in three ways: on a financial level, on a social level and an individual level. The Lewbel estimator was used on data from surveys conducted by PreventNed (N=4,994). The results suggest that there is a causal relation between workability and productivity and for happiness on workability. For the regressions of Productivity on happiness, happiness on productivity and workability on happiness, causality was only concluded for workers over forty. Even though not all relations are significant, all three concepts are important for the relations that were found and therefore should be of great interest to companies. A focus on these concepts can improve efficiency, reduce operating costs, improve employability, motivate workers and lower medical expenses. For these reasons ways to influence, measure and control workability, happiness and productivity should be examined and experimented with in the future.